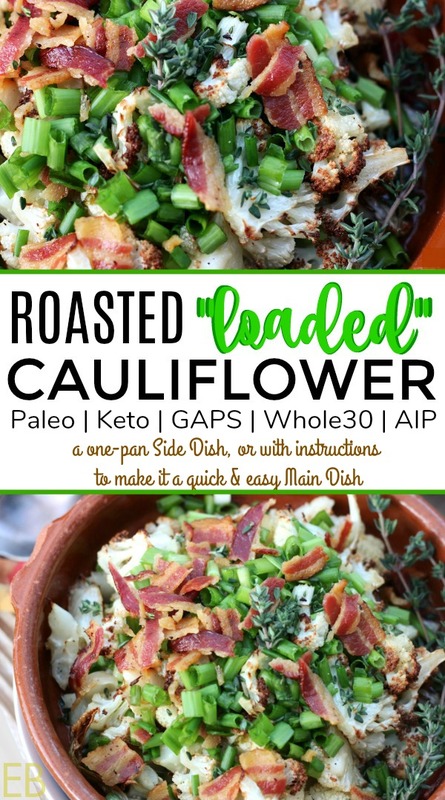 Cauliflower is one of those rare, perfect vegetables that’s creamy, rich and satisfying, yet it’s low in carbohydrates, so it fits all five traditional diets that are popular for healing the gut and wellness: Paleo, Keto, GAPS, Whole30 and AIP. Amazing. This is a one-pan side dish that can quickly become an easy main dish by simply adding a fried egg, or baked chicken pieces (thighs and drumsticks), which can roast while the cauli is cooking. 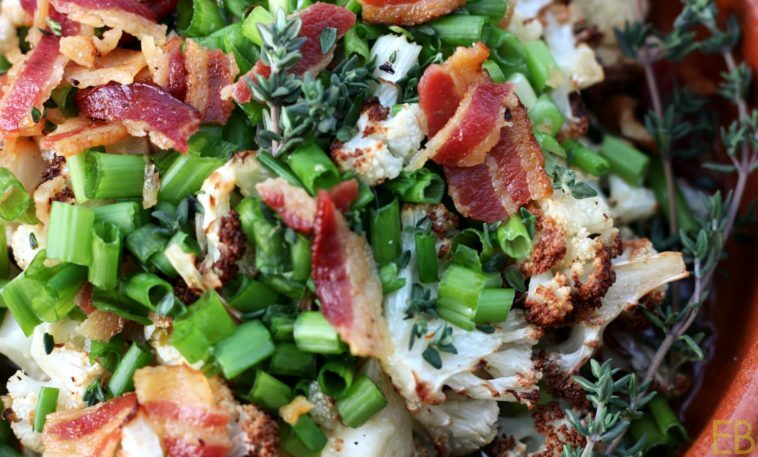 You’ll love how the cauliflower roasts in the bacon fat! 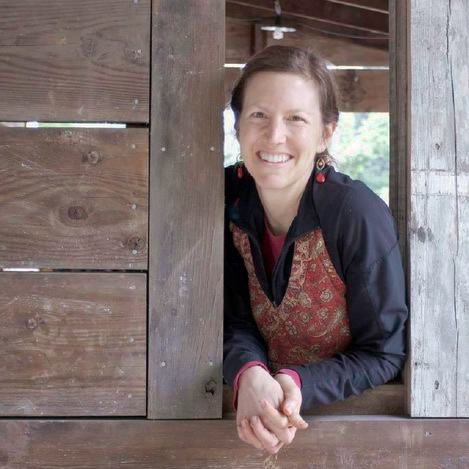 !– brilliant, effective, easy (one pan!) and delicious. Definitely include the green onions and fresh thyme. These toppings add so much, especially in winter, when we crave fresh food to keep our bodies happy and energized. Spread bacon out on a large baking sheet (preferably a half sheet [see link below in Recipe notes]). Bake until done, about 15-20 minutes. Remove bacon to plate, and set aside. Keep pan with fat. Roast cauliflower about 22 minutes, or until tinged with brown on its edges. Remove pan from oven. Add green onions' whites and optional cheese. Reduce oven temp to 200 degrees. Put back in oven for 5 minutes. Remove from oven. Transfer to serving dish with any pan juices. Top with green onions' greens and fresh thyme. Serve. For individual servings, plate individual portions, top with green onions and thyme, and top with optional fried eggs for main course dish. For egg-free and AIP option, top with simple roasted chicken and serve with side salad. Here's the half sheet baking pan I use for all non-reactive baking (roasted veggies, roasted chicken and baked goods). I am making this tomorrow for breakfast! I miss my eggs, but will top it with sausage! Thank you! Yay, Renee. Delicious and lovely! Sausages are definitely staples here too! Holy moly. Now I want that for breakfast! Yeees, with that fried egg, agreed! Thanks, Linda! This looks amazing! I can imagine it’s a great flavor combo! What a great way to dress up a simple vegetable dish. Looks amazing! I am SO making this!! What is there NOT to love??!! Yay, Tessa! I agree, fully good stuff! 😉 Thank you! This looks amazing. I’m thinking of adding avocado to mine at the end. Cool, sounds good! 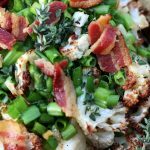 Love that with the bacon and green onions! Wow! Wow! Wow! 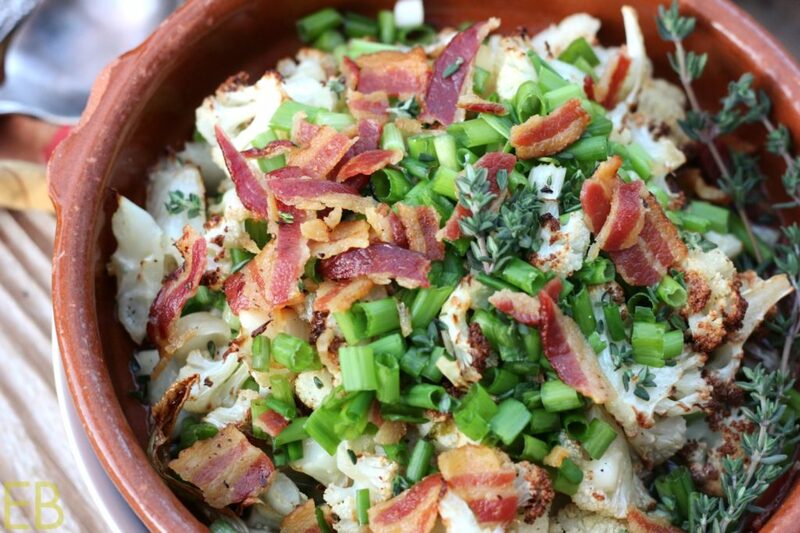 I have never wanted to dive into a bowl of cauliflower more! This ia a great idea. Beautiful image.